It is important to create strong, clear paragraphs when answering assessment questions. Let’s take a look at how a student has structured her answer to a short-answer question. She was given a case study scenario and is responding to a question about how she would identify the client’s needs. This is a strong paragraph for several reasons. First, it introduces the main part of the paragraph and contains the words “needs and issues”, which are the key words of the question. 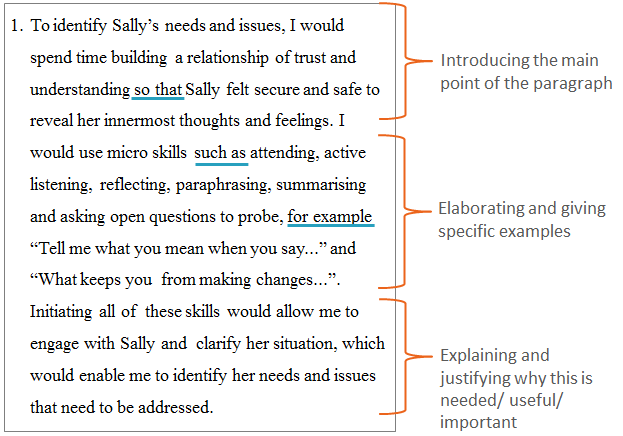 The student then elaborates on the first sentence, by giving specific examples of what she would do and say. Finally, the student explains why these strategies would be useful. Also notice that the student has used some good linking words like so that, such as and for example to help the writing flow.